Want an unforgettable holiday? Fall for our villas with infinity pools. These pools that literally "overflow" on one side of the pool give the illusion that they are endless. A high quality feature, its water plateaus are the ultimate luxury. Around the world, we offer a selection of villas with these pools that merge harmoniously into the horizon. Cascade or mirror, these pools will allow you to spend a wonderful holiday with all your family! From magical Asia to the exotic Morocco and Seychelles through to the Mediterranean climate of Ibiza and the Algarve, there is undoubtedly a villa equipped with an infinity pool that will enchant you. Do not wait any longer! Wanting exoticism? 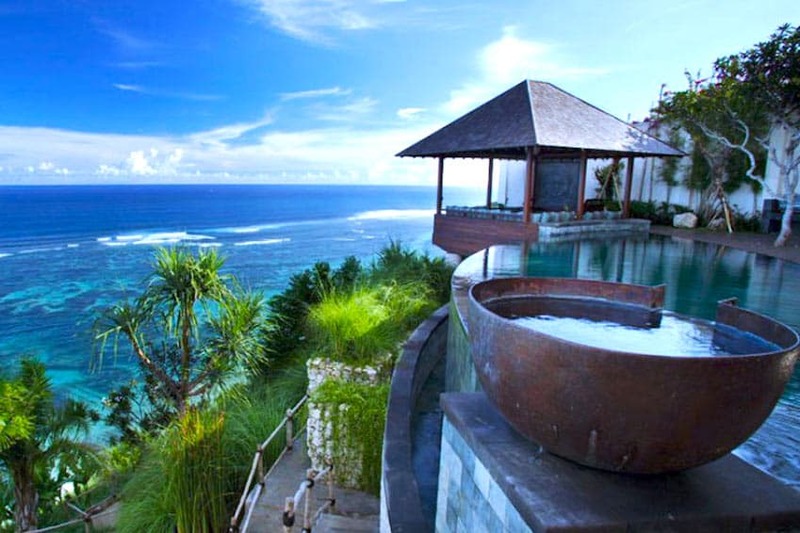 We offer you a selection of villas with infinity pools in Asia. Tempt yourself with the tropical landscapes of this continent full of mystery. Between magnificent volcanoes, lush landscapes and nature as far as the eye can see, you will not be disappointed! For your trip, what better than to rent a luxury villa with infinity pool? These pools that "literally overflow" on one side of the pool are a rare exclusivity not to be missed during your stay in Asia. Whether spectacularly cascading over to the Indian Ocean such as the one in Villa Jimbu in Bali; as a mirror reflecting the tall Asian palms of Villa Palm Blue in Sri Lanka; or as with the villa Akatsuki, in continuity of the infinite horizon of the turquoise sea of Thailand. The beautiful pool will bring out only the most sumptuous of your luxury villa! Let’s go to Indonesia, in the heart of this magical archipelago, to the 17,000 islands that have become unmissable. Between the huge volcanoes and centuries-old traditions, Bali is a jewel thanks to its wild jungles, its paradisiacal beaches and its luxurious vegetation. Overlooking a cliff, Villa Jimbu enjoys exceptional views and an enchanting setting amidst this mesmerising environment. Where statues of Buddha, water lilies, and calm dominate, its infinity pool accentuates the change of scenery. A huge basin from which a jet of water lands in the pool, gives the impression of a spa at the edge of the ocean. Located at the end of the cliff dominated by the villa, bathing in this infinity pool produces the sensation of dominating the Indian Ocean. You will be able to enjoy the lush aspects of the pool at any time of the day; a nocturnal bath due to its lighting, and at golden hour to admire the reflection of the sunset on the water plateau. Journey, then, to Sri Lanka. This island of Ceylon, still preserved from mass tourism, is well known for its lush nature and the richness of its biodiversity. From tea plantations to elephant processions, enchant yourself on this fascinating island. In the villa Palm Blue, the infinity pool promises an intense experience, since it contains salt water. Thus, located between the two Asian pavilions, as well as the triumphant palms and the white sand beach, the salted basin is totally melted in the scenery; the ultimate escape! Known for its welcoming people and its Buddhist temples, it is impossible to resist the fascination surrounding Thailand. As fascinating as it is splendid, it also owes its reputation to its immense beaches shaded by coconut palms and intimate bays all enjoying a singular beauty. 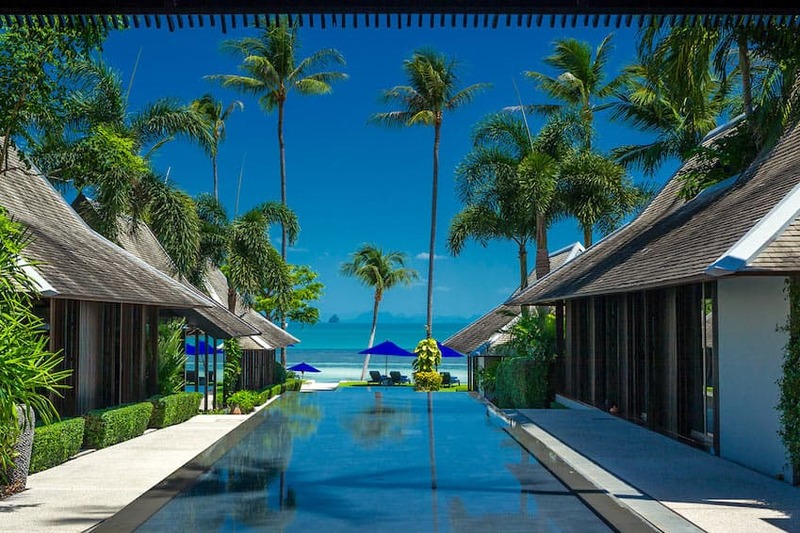 Located by the sea, Villa Akatsuki offers exceptional views of the sea of Koh Samui. This is a haven of tranquility, away from the crowd. The property has been designed in a Thai-Japanese spirit. In the middle of these traditional pavilions, appearing in several levels, the infinity pool is like a pathway towards the sea. We guarantee you an enchanting frame. Looking for a stay in the tropics? 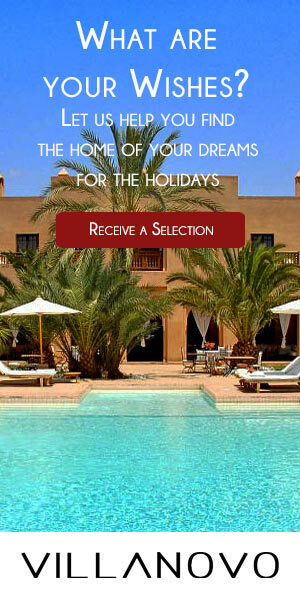 We offer you a selection of villas with infinity pools in Africa. Indulge in stunning natural African landscapes. From tropical forests to wild jungles, there is something for everyone! For spending an outstanding stay, rent a villa with an infinity pool. These pools are the embodiment of absolute luxury. The overflowing cascade is the most dramatic but the overflowing mirror ones have nothing to envy their sidekick. Indulge in this high standard equipment. At the gateway to Africa, Morocco will enchant you thanks to its countless deserts. From souks to riads including stunning medinas, discover this very colourful country. Among the must-see attractions, there is Marrakech, which seduces more and more travellers thanks to its huge cultural wealth. Take an enchanting stroll through the Palmeraie, the historical hotbed of Morocco. To make your stay unforgettable, rent Dar Na. At the heart of the Palmeraie, this stunning contemporary villa has a gorgeous infinity pool. By staying in this villa, your holidays will be timeless. For spending enchanting vacations, go to the Seychelles. This archipielago, composed of 115 islets, offers breathtaking landscapes. Let yourself be bewitched by these heavenly beaches’ turquoise waters. Lose yourself in the wild vegetation all around the island. With a unique ecosystem, the Seychelles are a not-to-be-missed destination for nature lovers. For an even more magical trip, rent our Beach Villa Praslin. Nestled on the East Coast of this eponymous island, this lavish property is a truly haven. To end the day, dive into the stunning infinity pool of the villa to spend luxury vacations that you won’t forget soon! A summer getaway in Ibiza definitely calls for your own pool, and why not go for the best? Infinity pools are undoubtedly just that. The Balearic island has very little rain between the months of June to September, enjoying glorious hot sunny days for the holiday period. When you need refreshment from the heat, your private infinity pool is the most luxurious and satisfying way to cool down. 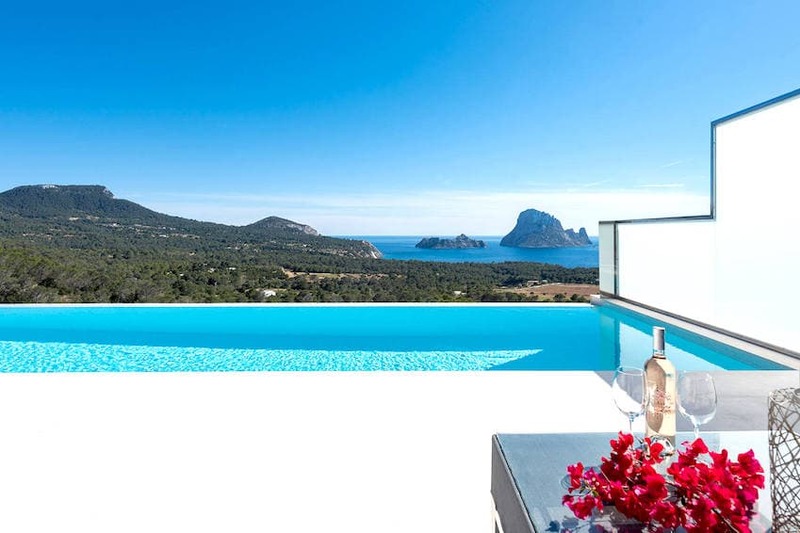 Villa 768 is located in the Southwest of Ibiza and is a villa that most enjoys the benefits of an infinity pool, as from the pool you have an incredible view of the islands Es Vedra and Vedranell. This first island is 385 metres above sea level and is pockmarked with caves, with many myths and legends surrounding it. As you bathe and admire its silhouette from your infinity pool, it is easy to entertain the myths that this island is the source of Ibiza’s energy. Cala D’hort beach is recommended as a viewing point of the dramatic island, however that is easily beaten by your elevated private viewing platform, floating in your pool which blends into the blues of sea and sky. High up on a hill, you can really take in the panorama of the surrounding lush green landscape and the tree-dotted plains leading to the dazzling ocean. On the spacious patio surrounding the infinity pool, you have many options for basking and soaking up the Mediterranean sun. Being in the Southwest, you will also have spectacular sunsets providing you with a private show from your pool, the vibrant pinks and oranges reflecting off the seemingly-endless surface. The Algarve on the southern coast of Portugal enjoys long, hot summer days and beautiful balmy evenings. Your days there will be dotted with cooling moments in a stunningly picturesque setting with your own infinity pool to relax in. Villa Minka has the fortune of a long pool overlooking the ocean, with the lovely green of palms and other trees punctuating the skyline. The pool is bordered by comfortable cushioned lounge chairs and a large sun parasol if you desire some shade, where you can lay and appreciate the sounds of the overflowing water. So rest your elbows up on the edge of infinity and savour the warmth of the Portuguese sun on your face while floating in your own private paradise. It’ll be exactly what you need in the pauses between exploring the fishing towns, wonderful beaches, historical sites and bustling nightlife of the region.